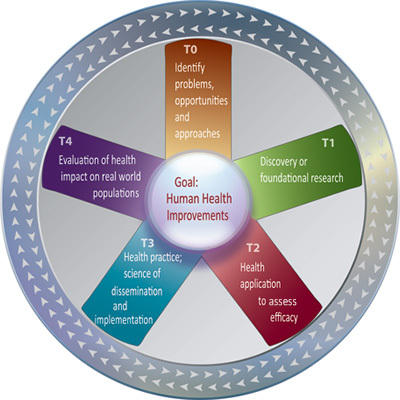 T0 is characterized by the identification of opportunities and approaches to health problems. T1 seeks to move basic discovery into a candidate health application. T2 assesses the value of application for health practice leading to the development of evidence-based guidelines. T3 attempts to move evidence-based guidelines into health practice, through delivery, dissemination, and diffusion research. T4 seeks to evaluate the “real world” health outcomes of population health practice. The graphic at right shows that the five phases of translational research do not necessarily move along a linear fashion; they often interact with each other through the entire spectrum in no particular order.